Right now ordinary people with long term health conditions in Heywood, Middleton and Rochdale are living in the future. That is to say, they're interacting with cutting edge health tech from Google's forward-thinking Verily Life Sciences, having found themselves in the middle of one of the NHS' seven Innovation Test Beds around the UK. And they're not alone. In Surrey, 700 people suffering from dementia, and their carers, will be trialling everything from eLucid mHealth's connected medication management to Sense.Ly's virtual assistant Molly and the Healtrix Internet of Things hub when the study goes live. A small group of 20 'Trusted Users', who are already testing the tech, say they are benefitting from being alerted to health problems earlier, extra peace of mind and more motivation to stay at home and out of hospital. Meanwhile, the Diabetes Digital Coach project launches in Bath, Bristol, Somerset and Gloucestershire this May. It's using tech from HP and health tech startups to try to help people with Type 1 and Type 2 diabetes manage their own care with apps, wearable sensors and IoT additions to their home. The Test Beds are all trials but when they were first launched in January 2016 at the World Economic Forum in Davos, NHS (National Health Service) chief executive Simon Stephens made clear that "successful innovations" - which help both patients and doctors - would be rolled out to other areas of the UK. The results could be huge: the TIHM Test Bed in Surrey aims to roll out the best systems to the whole of Surrey and North East Hampshire, covering as many of 16,000 people with dementia. And that long term conditions tele-health and tele-care programme in Rochdale? The goal is to expand it across Greater Manchester within two years. One trial that is already underway is the LCIA (Lancashire and Cumbria Innovation Alliance). The project is still recruiting but it currently has around 220 people testing out home health kits, apps and wearables. The scheme is for both people with conditions that mean they are at risk of being admitted to hospital (COPD, diabetes, heart failure) and dementia sufferers. Participants are grouped by risk of hospital admittance. So, for instance, people aged 55 and above with less than 10% risk or between 10 and 25% risk are signed up to trial either Intelesent or UMotif, two different apps that ask questions about daily health and offer prompts and reminders to take medication. The difference is that for people in the 10 - 25% bracket, that information is monitored by a GP or other clinician, below 10% and it's for their own personal use. People in the 10 - 25% cohort, as well as those with dementia, are also given the option of a wearable. 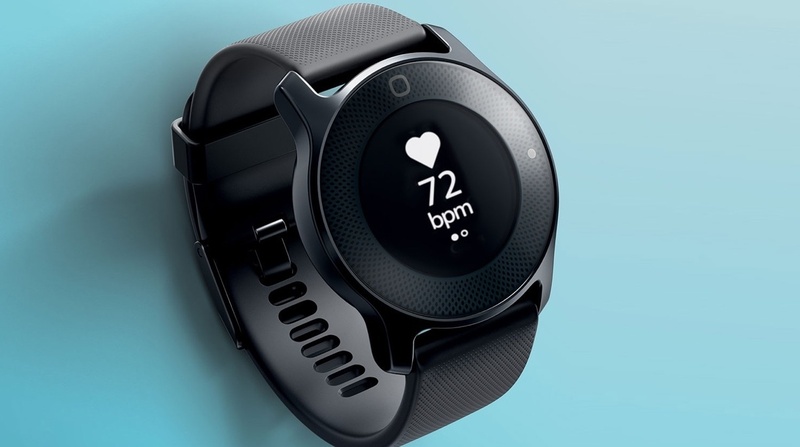 Remember the Philips Health Watch that launched at IFA last year? Here it's being used to keep an eye on activity and sleep levels. "Patients would be able to take all of the information from the Health Watch to the doctor to say: 'You told me to be more active to help my condition, this shows that I did this many steps, my heart rate was at this level'," says Lydia Smith, communications lead at the LCIA. "It's another way to encourage people to keep fit, keep active and manage their condition as best as possible." For the final group, above 25% risk of being admitted, they have a whole suite of devices installed in their home. It's all part of the Philips Motiva system - a tablet running an app that's monitored by doctors as well as devices like thermometers, scales and blood pressure monitors to allow people to upload their daily and weekly vital stats. "If there's a red flag, such as their blood pressure being way too high, a clinician can give them advice as to whether to come in," says Smith. "We also offer Speakerset, a Sky-type box which plugs into their TV and offers secure video consultations plus an automated text message system called Florence." The evaluation of the trial's impact on patient's outcomes isn't due from Lancaster University until around June 2018 and the costs potentially saved to the local health economy will have to be weighed against the costs of the tech, installation etc. It's too early to predict what happens next, but early signs are positive: "We don't have figures yet but from the clinicians we've been working with, it's great for them because if people have a risk of being admitted to hospital, they can be in a GP surgery once, twice or three days a week. It's freeing up clinical time for other people." Another continuous monitoring trial which is about to begin is Snap40. In May and June, a sensor packed health wearable will be tested on 500 patients in both A&E and general wards at two NHS hospitals in Fife and Edinburgh. The device is worn on the upper arm and tracks heart rate, respiratory rate, temperature, oxygen saturation, blood pressure, movement and posture. The info is transferred via Wi-Fi every two minutes and healthcare staff are able to access alerts and suggestions via smartphone apps. So, for instance, if someone is in hospital after an operation, Snap40's software can take the wearable data and analyse it to pick up minute changes in, for instance, temperature and alert doctors and nurses to patients at risk from infection. Those bulky machines you've seen on Grey's Anatomy are only used for 10% of hospital beds, mainly well-staffed intensive care units. "Coming from a computer science background, I was shocked and astounded by how non technological healthcare is today," says Christopher McCann, Snap40's co-founder and CEO who also attended medical school. "The process of trying to monitor and observe patients in hospitals and care homes is basically manual with nurses going round every four, eight or twelve hours. I couldn't understand why someone hadn't tried to automate this process and help the nurses to get the patients that are going to become sick far, far earlier." McCann says doctors and nurses tell him that the last thing they want is to have lots of data dumped on them that they don't have the "bandwidth to process." That's where computers and AI come in, with Snap40 ultimately aiming to be able to predict whether a patient is going to deteriorate before they actually deteriorate, based on historical data. And McCann is already in talks with other hospitals in the UK with plans to expand to six more by the end of 2017 as well as care homes and US hospitals. "It doesn't make sense to be siloed," he says. "Can we keep the patient safe and independent and healthy for as long as possible? You can't just do that in the hospital. Our focus is around a disease pathway from home to hospital and back home." The whole premise of these ambitious tests and trials relies on regular people becoming much more clued up about their health. Back in 2015 when the NHS was first setting out its digital health plans, one of the central targets was a system of electronic records. Then national director for patients and information Tim Kelsey predicted that by 2018 we'd have real-time access to our medical files and not only that but we would be able to enhance the data with wearable data from devices like Fitbits. "People will be able to take their wearable device and plug it into their clinical record," he said, "so that, when they want to, not only can clinicians see that data, they can enrich themselves with personal insights." The NHS is not going to meet that 2018 deadline, partly because the official care.data programme, proposing one single patient database, was shuttered after the 2014 privacy scandal. The Guardian revealed that patients would have no idea if their data had been sold to an insurer or drug companies by the NHS. Info up for grabs included smoking and drinking habits and long term conditions like cancer or mental health disorders - helpful for doctors, nurses and university researchers; very lucrative when outside interests get involved. The current national guidance is still that the NHS should go paperless, with electronic patient records that people are able to opt out of, by 2020. Multi-million pound local systems are starting to go live in places like Dorset and for anyone who wants to opt out, their data will only be accessed by the healthcare staff who are treating them. The recent news that a Fitbit partnership with the NHS may be on the cards is another sign of things to come. Fitbit CEO James Park said in a recent interview that he has had talks with senior NHS executives but that there are no plans to announce just yet. He did signal that the partnership will be similar to the one Fitbit Group Health has with US insurer UnitedHealthcare. This scheme gives people cheaper premiums the more they exercise. And who was a senior exec at UnitedHealthcare for almost a decade? The very same Simon Stevens who is NHS England's current chief executive. Now, when a Silicon Valley CEO implies that wearing a fitness tracker could provide healthcare discounts to Brits, this might raise some eyebrows. Sure, private health insurers like Vitality already have similar schemes with the Apple Watch but the NHS is free at the point of sale and will continue to be so, despite privatisation around the country, if various political party pledges are to be believed. Right now, only between 8% and 11% of people in the UK have any form of private medical insurance. So it remains to be seen how a Fitbit-NHS partnership would work. Would the activity trackers be given out as a freebie to selected low-risk patients? If not, what incentives could be offered instead of insurance discounts? And, importantly, can the NHS guarantee it won't sell our health data to the highest bidder? Be honest - what will get you off that sofa? Is it cold, hard cash? Unlike consumer tech, there won't be a daily trickle of news coming from these Test Beds and trials. As McCann notes, especially for clinically facing tech, "Quite rightly, hospitals need a large amount of clinical evidence to support their use." No matter the future savings, too, many NHS Trusts only have enough money to keep their services afloat, nevermind investing in connected health tech for the future. Still, hospitals, universities and the good people trying out this tech around the UK seem to be onboard with the direction the NHS is taking healthcare. Whether it's sensors or Skype-like services, virtual assistants or algorithms, the next 12 to 18 months will help to define how millions of people in this country manage their health, and how health tech startups and doctors work to prevent the conditions in the first place. "We're trialling different things, we're helping patients, we're trying to introduce a future way of working," says LCIA's Lydia Smith. "It's about learning what can be done, what's feasible and what can be financed. This is going to be a good learning curve."